The existing lighthouse at Cape May Point was built in 1859, stands over 157 feet tall and is still operated by the Coast Guard. Its beacon is visible for 24 miles out to sea and helps vessels navigate the sometimes treacherous eleven mile wide entrance to the Delaware Bay. Situated on the southern point of a six mile long peninsula of land, the structure is the third official lighthouse at the site. The other two were abandoned and eventually demolished because of poor construction and inadequate optics. The sites of these predecessors are now under water due to erosion. Just to the north of the lighthouse is The Cape May Migratory Bird Refuge. The preserve consists of 187 acres of wetlands and was acquired by The Nature Conservancy in 1981. This habitat provides a haven for a wide variety of fall migrating songbirds, waterfowl, shorebirds and raptors, as well as butterflies. Here they congregate to rest and feed before their taxing trip across the Delaware Bay. 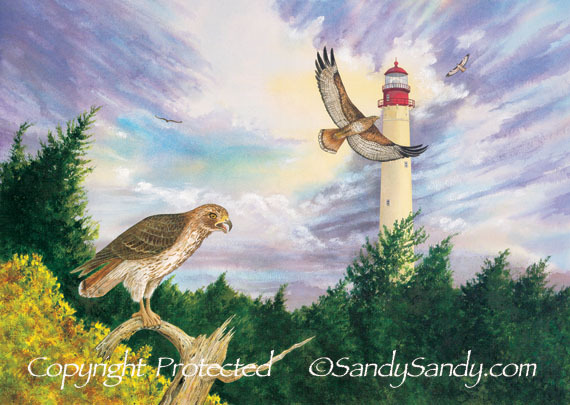 The autumn hawk migrations are especially thrilling for new and seasoned birders alike. Spectacular flocks fill the sky before a storm, as cold fronts push them down from the northwest.